The Octavius V. Catto Memorial stands on the southwest side of City Hall. It was unveiled Tuesday. In a city engulfed by controversy over a statue that stands just a short walk away, the unveiling of a new monument to a fallen political figure drew insightful words, history lessons and a cheering, street-blocking crowd that numbered into the hundreds on Tuesday. Five granite pillars and a 12-foot bronze statue celebrating the lasting life works of Octavius V. Catto were unveiled on the southwest side of City Hall just before 11:45 a.m. The work, titled "A Quest for Parity" and created by sculptor Branly Cadet, is the first-ever public sculpture on city land to honor an African-American. Catto – an educator, athlete, national spokesman for voting rights and civil-rights pioneer who, among other things, worked to desegregate Philadelphia’s street cars – was assassinated on South Street during an Election Day fight between white and black voters in 1871. It was the first day that African-Americans could vote in America, a right that Catto fought tirelessly for, but was never able to exercise before he was slain by an armed Democratic party operative who would be cleared by an all-white jury. His boldest and greatest accomplishments, however, were in the political arena, as a staunch supporter of the Union cause and the Lincoln Administration. Catto worked in the inner circles of the Republican Party to gain civil liberties for blacks and in support of the war effort. In Catto's own political ward, it was likely that blacks could change the balance between Democrats and Republicans in local offices. Still, Catto was a figure whose story went all but forgotten for more than a century. That would change about 15 years ago when Jim Kenney, then a city councilman at-large, sparked an effort in City Hall and outward toward the formation of the O.V. Catto Memorial fund. He explained why he took up the cause during an interview with WURD-AM last year. "Because an Irish Catholic killed him," he said. "I feel like somehow me being a part of this is me righting that wrong." Tuesday’s event – which drew Catto descendants, members of the Octavius V. Catto Society and the 3rd Regiment of the United States Colored Troops among others – was as much about looking toward the future as it was reflecting on the past. 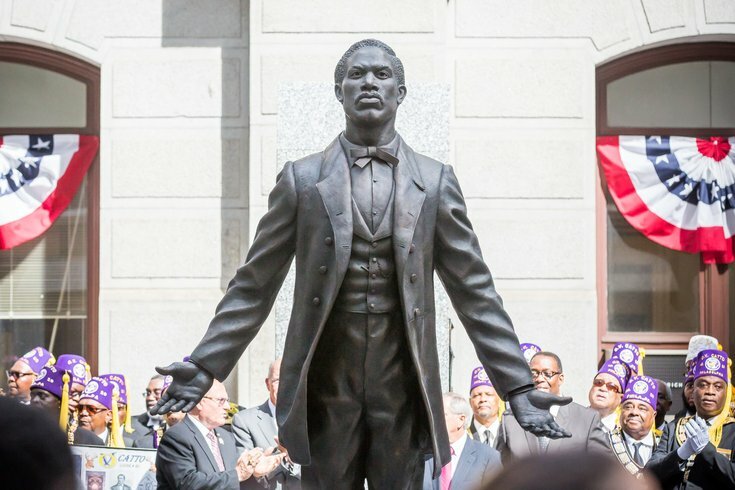 “My hope is that someday, every child in Philadelphia and every child in America will know as much about Octavius Catto as they do about George Washington, Benjamin Franklin and Dr. Martin Luther King,” Kenney said minutes before the statue was unveiled. Carol C. Lawrence and James B. Straw, chair and president respectively of the memorial fund that secured monies for the sculpture, noted that the passage of time has offered a broader lens to see the impact Catto had on society itself. “This is a historic day in Philadelphia,” Lawrence said. Sam Katz, the three–time mayoral candidate, noted that his History Making Productions produced a short video on Catto’s life and impact. “Catto's story embellishes the role Philadelphia played in the struggle for equal rights,” Katz told PhillyVoice. “His murder on Election Day reinforces what a divided and violent 19th century city ours was.